Zimbabwe’s 2018 election: what do the manifestos say about land? The Zimbabwe election has been set for July 30, and some of the manifestos have been published. What do they say about land and agriculture? 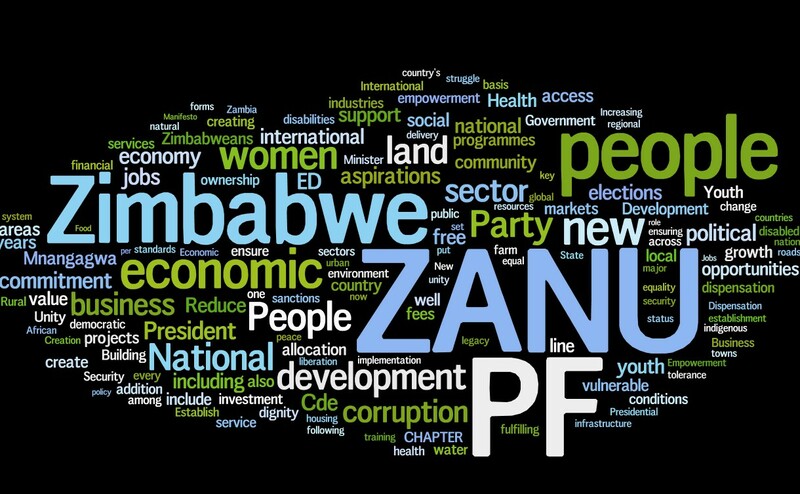 There are many parties standing and plenty of independents, but only two parties count: ZANU-PF, led by E.D. Mnangagwa and the MDC Alliance, led by Nelson Chamisa. The ZANU-PF manifesto runs to only 25 pages (although it says it’s a summary, but I cannot find anything longer), while the MDC Alliance one is 106 pages long. I put both into Wordle and these are the word clouds produced. In many respects the basics are very similar. Lots of talk of growth, change, investment, delivery, with help being offered to nearly every sector of society. There are grand plans for technology and infrastructure, and all the rest of the fairly predictable, but in practice very unlikely to be implemented, manifesto fare. ZANU-PF makes much of its liberation credentials and its ‘unparalleled achievements’, although there’s little mention of former President Mugabe, except in a telling of the glorious history of President Mnangagwa. The MDC manifesto is much more comprehensive and professional, even adorned with expensive Shutterstock photos, all imagining a new, tech-driven, modern future. There’s only one mention of the notorious bullet train, referred to now as ‘super-fast railway wagons’, and no mention of its speed. God features in both manifestos, but especially in Chamisa’s foreword, which refers to an ’empathetic, God fearing and God loving leadership’ of the MDC. So what of land? Both manifestos reiterate the ‘irreversibility’ of the land reform (p.20/p.47). ZANU-PF not surprisingly celebrates the land reform, while the MDC deploys the familiar narrative, referring to it as ‘chaotic and poorly planned’, destroying agriculture in the country (p.55). Both manifestos commit to new systems of land administration, executing an audit, removing illegal multiple ownership, implementing farm size ceilings and guaranteeing the Constitutional commitments to support a Land Commission and so on. So nothing new here, and all consistent with current policy. While not reversing land reform, and being committed to a smallholder base for agriculture, the MDC Alliance manifesto has a surprising paragraph in a section on housing (p. 67) that claims that a new government will ‘liberate’ 2 million hectares from the land reform programme areas, handing this over to local authorities. This represents around a quarter of all land allocated during the Fast-Track Land Reform programme, and it is unclear how this will be achieved. Both manifestos, perhaps especially the ZANU-PF one, focus on youth and women, and the need to gain access to land. Through this the gender dimensions and the cross-generational questions of land are highlighted, but few solutions are offered beyond training, business hubs and so on in either manifesto. More differences come when plans for tenure reform are mentioned. ZANU-PF sticks to existing policy, with renewed commitment to increase security of tenure, and issue 99 year leases for A2 farms, linked to a releasing finance through collateral security. The MDC Alliance manifesto by contrast is rather confusing. There is a lot of bluster when describing the ‘transformation markers’ and the ‘smart’ agriculture plan (p.26 and p.45, for example) about the importance of a land market and land titling, claiming that this will create security of tenure and open up finance opportunities (a controversial position not supported by international evidence), but then in other places it suggests that there will be a mix of titles, leases and occupation certificates as part of a seemingly more complex response. MDC Alliance plans for tenure reform extend to the communal areas, where there are plans to issue transferable ‘occupation certificates’ to all communal area farmers, issued by the devolved district administration and overseen by traditional leadership. Quite how this will work is anyone’s guess, and the consequences of an accelerated land market in the communal areas will throw up all sorts of problems. 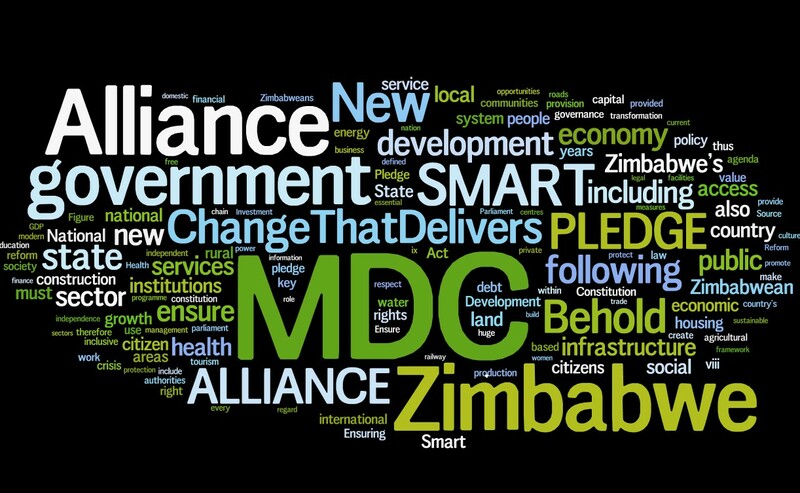 Both manifestos also have big ambitions for agriculture, seen as central to economic growth, attracting business and creating, in the MDC’s words a 100 billion dollar economy. There is the usual mix of irrigation investments, input supply, service support and so on, but again little detail on how, where, when and who pays. While ZANU-PF commits to continue ‘command agriculture’, the Alliance says it will abolish it and replace it with ‘smart agriculture’. For the MDC everything is smart, while ZANU-PF it’s all command policies. Yet for agriculture and more generally, both show a commitment to a style of democratic developmentalism, as well as a strong dose of technological optimism (one of the MDC’s photos linked to text on agriculture shows a drone spraying crops). And plenty of neoliberal investment-friendly policies are scattered around both manifestos to attract the donors and investors. For both, Zimbabwe is definitely open for business, to use ED’s overused phrase, and corrupt practices, it is claimed, will be stamped out. The MDC Alliance offers more details on how this will be done with a new culture of government, and a lean and professional bureaucracy. Noone knows what the election outcome will be. This time the elections are being fought in quite different circumstances. 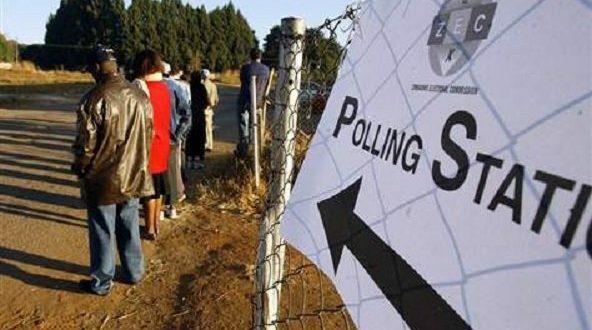 While there remain problems with the electoral roll, there has been electioneering in the rural areas by all parties. There have been large crowds gathering for both the MDC Alliance and ZANU-PF. Who knows if it is the free t-shirts and food, or real interest. I doubt many will bother to read the manifestos. Yet this time around there is certainly a live debate and two very different presidential candidates, spanning generations. Recent opinion polls suggest that Mnangagwa has the edge in the presidential poll, but it may go to the second round. In the parliamentary and local elections there are more independent candidates than previously adding an interesting local complexion, and if the primaries for both main parties are anything to go by there are important local contests too. Assuming the mass of international election observers judge the polling to be ‘free and fair’, we will know the result in August or September. Whoever takes control, land and agriculture are certainly going to be high on the agenda. Interesting piece, excellent summary of the two manifestos.